Yamaha Motor IM announced today that Alpha, the world leader in the development, manufacturing and sales of innovative electronic materials used in the electronic assembly process, has chosen the YAMAHA YCP10 High-Performance Compact Printer for purchase and installation at a key laboratory facility in New Jersey. After rigorous print testing, the YCP10 demonstrated the ability to deliver the consistent printing results that the Alpha evaluators were seeking. The YCP10 features an easily-controllable operation system and is supplied standard with a user-friendly, easy to operate touch panel, including multiple language options. 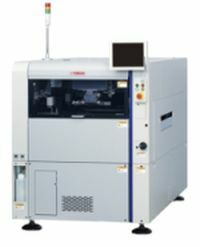 A wide range of optional features includes a remaining solder detection function that monitors the remaining solder on the stencil to enhance printing quality, and a printing inspection function that carries out minute and effective solder printing inspections using a purpose-designed high-performance optical camera. The YCP10 complies with CE safety design standards, enabling the equipment to be sold worldwide. Yamaha Motor IM is a subdivision of Yamaha Motor Corporation, and has employed its core technologies in the areas of servo-motor control and image recognition technology for vision (camera) systems to develop solder paste printers, printed circuit board inspection machines, flip chip hybrid placers and dispensers. Yamaha Motor IM offers a full line of machines for electric/electronic parts mounting and other production-line solutions to answer the diversifying needs of today’s electronics manufacturers. Yamaha Motor IM has sales and service offices in Japan, China, Southeast Asia, Europe, Brazil, and North America, providing a truly global sales and service network, delivering best in class on-site sales and service support for their customers. Alpha, a subsidiary of MacDermid Performance Solutions, is the world leader in the development, manufacturing and sales of innovative materials used in the electronic assembly process. Alpha is a full line supplier of Solder Paste, Solder Preforms, Stencils, Liquid Soldering Flux, Soldering Alloys, Cored Wire, Surface Mount Adhesives, Electronic Cleaners and Sinter Technologies that serves a wide breadth of industries such as electronics assembly, power electronics, die attach, LED lighting, photovoltaics, semiconductor packaging, and automotive.